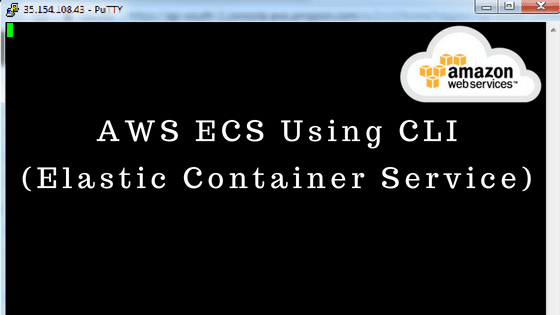 ECS is container management micro service provided by AWS. It is highly scalable and fast way to manage / start / stops Docker containers within AWS cloud. It allows easily to manage applications running under docker containers and deployed on ECS cluster of EC2 instances. When you deployed docker container in ECS that means you placed them on cluster which is logical grouping of EC2 instances. ECS allows us to access some core important features like security group, EBS volume and Elastic Load Balancer (ELB) same like EC2 Instance. ECS is an abstraction of EC2 service so instead of using EC2 virtual machines we can use most compact portable docker containers. AWS provides APIs to automate and integrate with AWS ECS services. Docker File: Is s simple text file, defines app environment and dependencies libraries. Reduce build image size and number of layers. For example don't add unnecessary things in image and keep it optimized. Use specific tag naming conventions for version of image so that we can rollout and rollback image. For example: Version 1.0.0.1 & Version 1.0.0.2 etc. In case of multi region pull same image and push to all region. Is a packaged application code like source code, dependencies libraries, environment variables, config files etc. It is reproducible, portable and immutable that means you can run this image on any platform. It is a docker container registry which is fully managed that means you no need to manage infrastructure & hosting these docker registry. It is highly available as it internally using S3 service. It is secure as it uses IAM resource based policies so you can provide push permission to some account and pull permission to other account user. It is logical grouping of all resources that you have. They are EC2 instances with ECS agent installed on ECS agent. ECS agent is a open source software that looks state of instances and respond back to service. Defines application containers which includes image URL , CPU , and memory requirements. etc. It is a blueprint of task. Run and maintain the desired number of copies of tasks. Unhealthy task automatically replaced with healthy tasks. It very similar to EC2 auto-scaling concept. You can link two containers and established a network between them to talk each other. For Example: There are 2 applications one in JAVA and other in .NET and both are in different containers, then using APIS they can interact with each other. You can use containers to create distributed applications by breaking your application into independent tasks or processes like AWS microservices. You can have separate containers for your webserver, application server, message queue and backend workers. Containers are ideal for running single tasks, so you can use containers as the base unit for a task when scaling up and scaling down. Each component of your application can be made from different container images. Docker containers provide process isolation allowing you to run and scale different components side by side regardless of the programming language or libraries running in each container. Ubisoft gaming company using AWS ECS. They creates, publishes, and distributes popular interactive video games for players throughout the world. 1. Update the installed packages and package cache on your instance. 2. Install the most recent Docker Community Edition package. 3. Start the Docker service. 4. Add the ec2-user to the docker group so you can execute Docker commands without using sudo. 7. We will use Docker compose to run all containers with a command (wordpress , mysql , phpmyadmin containers) define all these containers in one yaml file. 12. Below command will create 3 containers and you are done with setup.